Brown/Williams; Nelson; Riddle; Sting /Summers/Z; Zappa. Very Good. In very good packaging. 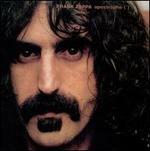 Frank Zappa-Broadway The Hard Way by Frank Zappa. Brown/Williams; Nelson; Riddle; Sting /Summers; Zappa. New.